Like all fathers and those with dependents, beekeepers are kept busy trying to rear a happy and healthy brood, cope with strong females in the form of Queen bees, and ensure their brood is well fed and housed. That’s not all, beekeepers also have to go the extra mile to keep their bees safe, whether collecting and rehiving swarms of honey bees that would not survive in the wild, or treating their bees against threats from pests like the deadly varroa mite. 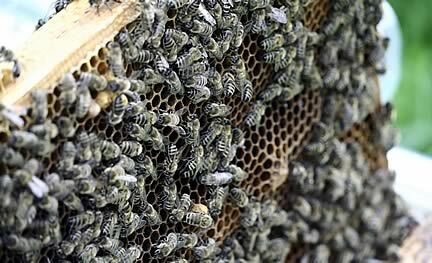 Beekeepers also have to cope with the weather, and after a dismal summer last year that saw UK beekeepers report an unprecedented 72 per cent reduction in honey production, the prolonged cold spring has continued to cause further problems to the decimated bees. A perfect gift for anyone interested in the world of beekeeping, Adopt A Beehive is the only virtual adoption scheme in the UK that raises funds for applied research and education projects into honey bee health, and gives adopters a chance to follow their adopted beekeepers highs and lows throughout the year. Adopt a Beehive can be purchased online at www.adoptabeehive.co.uk; or by phone on the local call rate number 0845 680 7038. One of three mouthfuls of food we eat is dependent on pollinators like the honey bee, and with virtually no honey bees left in the wild, beekeepers are the last guardians of these hard working insects. Through the Adopt A Beehive scheme you can follow one of 18 beekeepers across the country, from the Hobbs Family in the South East, to the President of the Scottish Beekeepers Association Phil in Ayr, or Jules in the Midlands, who runs beekeeping courses and small-holding training sessions on her farm. The BBKA believes training is essential to ensure beekeepers have the skills they need for best husbandry and the ongoing protection of our honey bees. All Adopt beekeepers are trained to the highest level, with two recently becoming master beekeepers, the highest level of training a beekeeper can achieve, whilst two are microscopy experts and the rest are either trained swarm collectors or involved with training beginner beekeepers. Adopt A Beehive has revealed that all but one of the nineteen adopt beekeepers across the UK and Northern Ireland have lost at least one beehive due to the bad winter weather. The prolonged cold and wet weather kept bees confined to their hives for far longer than usual, disrupting colonies feeding processes, and breeding patterns. Ian lost three hive last winter, largely because of the poor weather, and a similar story could be found with Peter Hutton, one of the Adopt A Beehive beekeepers in the South East, who despite having over 50 years experience of keeping bees, has lost or expects to lose thirty five per cent of his honey bee colonies due to the prolonged cold. The BBKA’s definitive Winter Loss survey will be published in June which will clarify how typical the Adopt beekeepers are of the wider beekeeping community which they represent. The BBKA’s Adopt A Beehive campaign is the only scheme in the UK that directly funds applied research into applied research and education projects into honey bee health. All adopters receive a welcome goodie pack full of honey bee goodies, and receive three seasonal updates of their local adopted beekeeper throughout the year.